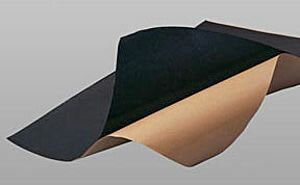 Sound damping sheets is a bitumen-based, self-adhesive sheet used for sound and vibration damping on metal panels. The adhesive side is smooth, giving complete contact with the underlying surface without air pockets or channels. Soundamp E is odorless, wear-resistant and impregnated to prevent the absorption of water. Both pad material and adhesive can withstand temperatures between -30° C and +120° C (-22° F to +248 ° F) and are highly resistant to aging. Typical applications include metal partitions, ducts, transportation industry, and office machines as well as numerous architectural applications. SoundampE is easily handled, and may be cut with scissors, utility knife, or die. SoundampE should be cut into the desired shape before the backing paper is removed. The temperature of the pad and application surface should not be below room temperature during fitting. Storage life 6 months max. Preparation: clean surface. Be sure to remove all oil, loose paint, scale, dirt or other foreign material. 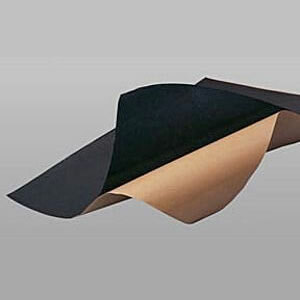 Soundamp E should only be applied when the ambient and substrate temperature is 70° to 80° F.
Method: Soundamp E should be applied to the surface of the substrate with a roller that can exert pressure to ensure an even bond between the PSA on the damping sheet and the substrate. Remember During curing the ambient temperature should be between 70° and 80° F. Once curing process is complete both the damping sheet and the PSA adhesive should withstand temperatures between -22° and 248° F.
Sealing: In outdoor applications sealing the Soundamp E is not necessary but may help preserve the damping sheet. Shelf life: unopened packages should last up to 6 months, if stored between 32° and 86° F.